DAMAN or Damao is a quaint little port on the West Coast of India. It has been the coveted prize for which princes and potentates, local satraps and alien powers waged wars. Occupied by the Portuguese for four and a half centuries, traces of the European influence are still there as in Goa where the laid-back, susegado (contentment, not laziness) is vaguely palpable. Legend has it that a Portuguese captain Diogo de Mello first found it because it was a storm that forced him to take shelter there while on his way to Ormuz. A paradise of tranquillity, its 12.5 km coastline along the Arabian Sea was once known as Kalan Pavri or the "Lotus of Marshlands." The sleepy township is divided by the Damanganga river with Nani (or little) Daman in the North and Moti (or big) Daman in the South which retains some of its Portuguese ambience in its buildings and churches enclosed within imposing walls of the Fort. The massive Fort that runs round the settlement like a girdle, dates back to 1559 A.D. This structure encompasses about 300 square metres with 10 bastions and two gateways. Enclosed within the Fort is the Governor’s Palace, collectorate, secretariat and other official buildings, having a moat on the land side and connecting the river Damanganga to the Arabian Sea. In fact, the whole city, or its most important limbs, are within the Fort. The floods last August have left the bridge at Nani Daman broken and one has to take a long route to get from one Daman to the other but it has become a new tourist attraction. It rained so heavily that Daman recorded over 500 mm. of rain in 24 hours. All the 10 sluice gates were opened but this did not prevent the bridge from collapsing. Conservator of Forests, Richard D’Souza, was marooned and had to be rescued from his residence at 10 pm. The Church of Bom Jesus (the same name as the one in Old Goa that houses the relics of St Francis Xavier) is a startling presence with its gold-gilted altars, richly carved main doorway and highly decorated interiors. Built in the 16 th century, the narrow lanes and bylanes in its vicinity are reminiscent of the similar Latin quarters in Bandra, Mathapacardy and Kotachiwadi in Mumbai. To this day many of the inhabitants of this exquisite land still speak Portuguese, actually now a quaint dialect, a mix of Portuguese and Gujarati. They also are believed to consider themselves exclusive, like the Panjimites in Goa, who are mischievously referred to PLOs (Portuguese left-overs). These Indo-Portuguese people have long been identified with mechanical and fishing trades. Renowned Portuguese writers and intellectuals ravelled to India in the 16th century and contributed to a unique Indo-Portuguese architecture, music folklore, literature, art, ballads and theatre. Some of them have survived time. The tribals which comprise Konkanas, Warlis and Dublas (it doesn’t mean poor) are hard-working and it is a close-knit community. They are mostly Hindus but they also have their tribal gods. For example the Warlis (known for their paintings) have the sun and moon as the two eyes of God. Stone images of these gods are found in the open countryside and the Forest Department has set up a Tribal Centre at Silvassa where their lifestyles have been captured in figures, weapons and utensils. Daman can boast of a rich and multi-faced cultural heritage in which dance and music play an important part in the life of a Damanite. Here is a true fusion of cultures—tribal, urban, European and Indian. Various Portuguese dances are well preserved as are the tribal dances with caustic social comments. 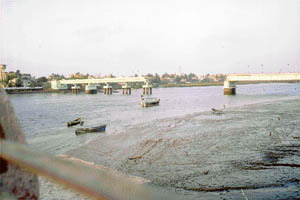 Jampore beach is on to the border of Gujarat. Though not as clean as some of the beaches in Goa, it is a place to enjoy nature in its sublime solitude. The beach is safe and when the tide is out one has to walk a great deal to get to the water. Devka beach has a long shoreline but its attraction is the musical fountain and the kid’s corner. The Kadalya Lake Garden is a man-made wonder with its swan-boats and two toy trains which keep kids glued to these pastimes. It’s a dreamland for children. The restaurant offers a panoramic view of the place and a variety of cuisine. The Forest Department has to be commended for this effort.